NEW FOR 2011 !!! 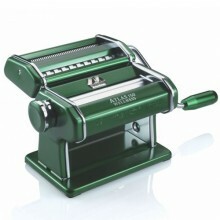 Green Deluxe Atlas Wellness Pasta Machine. WOW. The new Deluxe Designer "Colors" Line by Atlas Marcato is simply stunning! Everything you have come to expect from Atlas Marcato and a little more: a superb italian design; anodized aluminum, nickel FREE, chrome FREE, deluxe handles and clamps also in anodized matching colors, patented "wellness" rollers made of light alloy which GUARANTEE there will be absolutely no residue of any metal in your pasta. The pasta you prepare with the Atlas wellness models will be absolutely pure; they feature a raised metal logo plate; only the finest materials are used with excellent workmanship. This unit will make 4 types of pasta: flat roller unit for LASAGNA, cutter for FETTUCCINE (tagliatelle), special spaghetti cutter with which you can make ROUND SPAGHETTI 2mm. with a thicker dough sheet and a flat noodle (TAGLIOLINI 1.5mm flat) if you use a thin dough sheet. All attachments to the regular Atlas 150 will fit this machine. All components, parts and assembly entirely made in Italy. 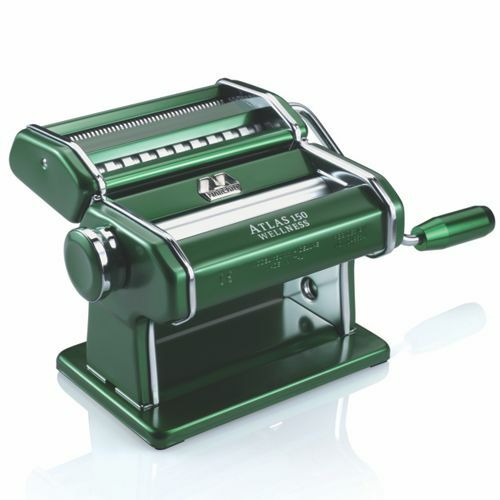 Click the button below to add the Deluxe Atlas Wellness Pasta Machine GREEN to your wish list.